Redfin shares closed at $21.70 on their first day of trading. That’s up roughly 45 percent from Redfin’s IPO price and pushes the high-tech brokerage’s market cap over $1.7 billion. Big day for real estate. Could herald a flood of capital into the industry. Redfin’s strong performance today is “a signal that investors are supportive of new models that change the traditional way real estate works,” said Mike DelPrete, a real estate tech consultant. Who will Wall Street get behind next? Redfin’s stock has exploded, but Realogy and Zillow Group, widely considered Redfin’s two top publicly-traded competitors, haven’t seen their share prices suffer. Realogy’s stock clocks at $32.97, up 0.15 percent today. Zillow Group shares are trading at $45.22, up 0.67 percent. At $21.40, Redfin’s stock price has surged roughly 43 percent above its IPO price, which was already $1 above Redfin’s previously issued guidance. Kelman owns Redfin stock worth tens of millions of dollars. What will he do with his fortune? Kelman compared Redfin to Apple, Uber and Lyft at different points. When it was pointed out to him that Uber is not profitable, Kelman said, “You have to cut me some slack. It’s my first day.” Everyone cracked up. “They’re going to make less on every single home,” Kelman told CNBC, when asked how working for Redfin could appeal to real estate agents. Kelman was just interviewed by CNBC. When asked how commission rates have largely held steady over the years, he noted that buying a house is much different than buying a stock. But “nonetheless if you offer better service for less money, thousands of dollars less, and you sell homes for more money, you’re going to take share and that’s why we we’re able to go public today,” he said. Redfin is not “like Radio Shack of real estate but feels like the Apple of real estate,” Kelman told CNBC. Redfin might be able to grow faster if it switched from employing salaried agents to using agents who work on commission as contractors, like most brokerages. Only time will tell if Redfin comes under pressure to make this shift. But the brokerage has long believed its employee compensation model, which rewards agents based partly on customer satisfaction, is key to aligning agent and consumer incentives and providing a consistent service experience. “There’s all sort of investors who can buy your stock who are interested in a quick pop. But, thankfully, he said, Redfin was able to attract investors who believe in the “durability of growth” that will result if Redfin treats its agents well and delivers better service to customers, even at the cost of short-term gains. But despite this, Redfin’s board decided to continue to provide rebates anyway. It wanted to stick to its mission of putting customers, he said. But can Redfin still justify engaging in irrational behavior now that it’s accountable to public shareholders? “I think a purely economic analysis of buyer rebates would not support the pricing we have, but since when has that been the only kind of analysis we’ve done?” he told Inman today. Redfin has scaled back its buyer rebates over the years. But it’s dangling lower commission rates than ever to sellers, trimming its listing fee to 1 percent in some markets (excluding the 2.5 or 3 percent commission typically paid by Redfin sellers to buyer’s brokers). IBuyers, high-tech investors that make quick offers on homes and can close in days, have generated a lot of buzz in the industry. Though sources say Redfin had been working its own iBuyer for well over a year, the company didn’t reveal the operation, dubbed “Redfin Now,” until late June in its IPO filing. “I just want to meet every single person who uses Redfin Now and understand why he or she did,” he said. Redfin’s market cap signals expectations that Redfin will churn out industry-leading technology. What are the projects at Redfin that Kelman is the most excited about? Kelman is particularly pumped about Redfin’s on-demand showings, he said. By getting homebuyer clients into homes lickety-split, the technology is “changing the competitive metabolism of the market,” he said. Kelman also cited technology that Redfin is developing to sell homes faster. He mentioned innovation around helping prospective buyers “see what’s going on inside” Redfin listings, accessing them and generating offers for buyers that want to purchase its listings. Does that mean Redfin will use smart locks and live video to help boost the exposure of its listings? Kelman also has high hopes for Redfin’s new mortgage arm. It could eventually help Redfin clients “compete like cash buyers” and would play a key role in allowing Redfin to eventually offer a “purely digital closing,” he said. Will Kelman and crew party hard tonight? Looks like it might be somewhat tame. Redfin CEO Glenn Kelman is scheduled to discuss Redfin on CNBC in just a little. Redfin’s performance shows that, for now, investors are treating the company as a technology company, not a real estate brokerage. It’s trading at a market cap equal to roughly six times its annual revenue in 2016. Well, maybe not quite $3 billion, but the IPO would seem to quell fears that investors might see Redfin as little more than a discount brokerage. Redfin’s stock just jumped 40 percent above its IPO price. Investors have clearly bought into the company’s mission to “redefine” real estate. 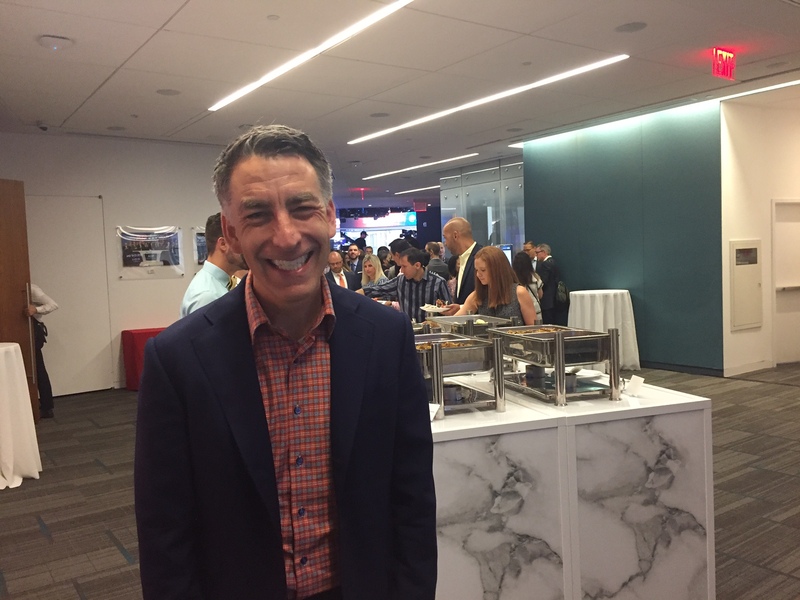 Redfin CEO Glenn Kelman didn’t sleep well last night because he’s a little sick — not due to butterflies, he told Inman in a conference room at the Nasdaq studio this morning. But he got a pick-me-up in the form of a text message: a confetti GIF from Spencer Rascoff, CEO of Zillow Group, who some analysts believe is Redfin’s biggest competitor. “Genuinely nice,” Kleman called the gesture. Redfin shares have surged 36 percent to $20.48, giving the company a market cap of over $1.6 billion. Redfin CEO Glenn Kelman, like all of Redfin’s shareholders, didn’t cash out any of his stock through the brokerage’s IPO, but his ownership of the company was worth $40 million this morning. Many analysts have seen Zillow Group and Realogy as Redfin’s top publicly traded competitors. We’ll be watching trading of their stocks today. Zillow Group shares are trading at $45.08, up 0.35 percent today. Realogy shares have slipped by 0.3 percent to $32.82. 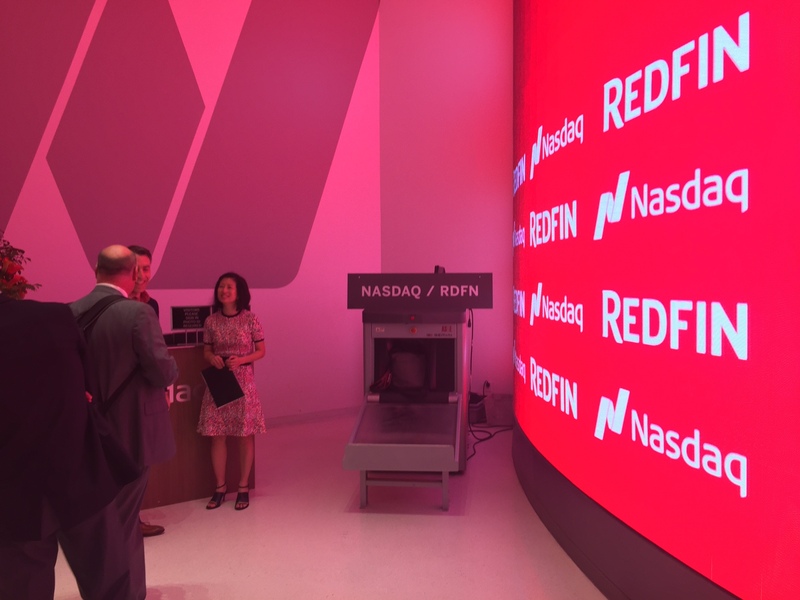 Update 9:44 a.m. EST: Watch Redfin ring the bell for the opening of the Nasdaq. Update 9:41 a.m. EST: Founders of other high-tech brokerages will be watching Redfin’s IPO closely. Strong interest from investors would bode well for their ability to raise more money or get acquired. Joshua Hunt, CEO of Denver-based low-fee brokerage Trelora, says he’s recently received a flood of questions from venture capital firms and industry watchers. “The announcement for [Redfin’s] IPO — we have seen much activity on our front of everybody trying to figure out what this means for the future,” he said. Trelora recently closed a $4.5 million funding round with plans to bring its low-fee brokerage model to new markets. Redfin has priced its common stock at $15 per share, $1 more than the maximum offer price forecasted by the company. 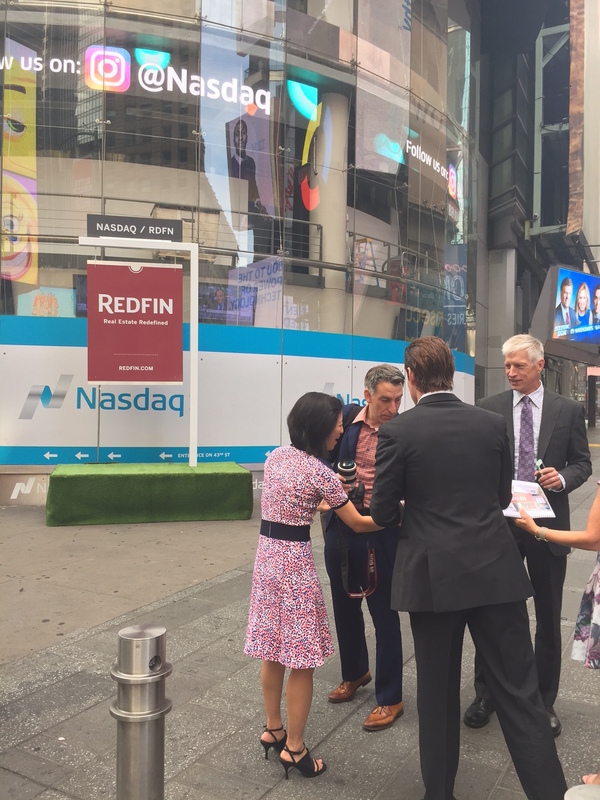 Redfin execs and employees posed in front of a Redfin sign outside the Nasdaq building this morning. 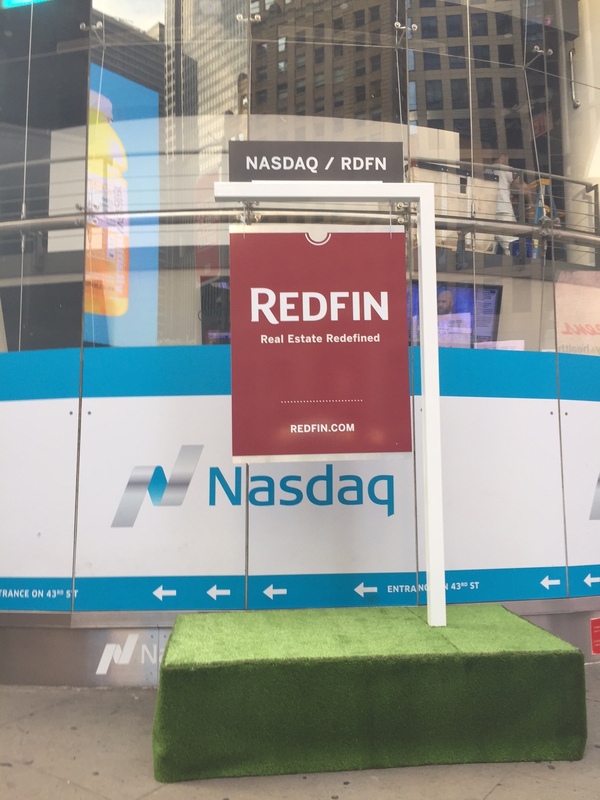 Redfin will ring the bell for the opening of the Nasdaq stock market at 9:30 a.m. EST today, launching an IPO that’s expected to raise over $100 million for the high-tech brokerage at a valuation north of $1 billion. Follow our live blog for updates on the action, including coverage of Redfin’s stock performance and reactions from across the industry. Will investors buy into Redfin’s vision of using technology to produce a smoother, faster and cheaper real estate transaction? How will CEO Glenn Kelman and crew react as their fortunes rise or fall with the market? Will the stock’s performance herald a wave of new investment in real estate tech or temper expectations of an industry shakeup? And how will Realogy and Zillow Group shareholders react? Perhaps no other real estate brokerage has taken a bigger stab at reshaping the real estate business. The company has traveled a long and rocky road, learning how to, in the words of CEO Glenn Kelman, “fight like wild animals,” while navigating the roadblocks of a deeply entrenched industry. 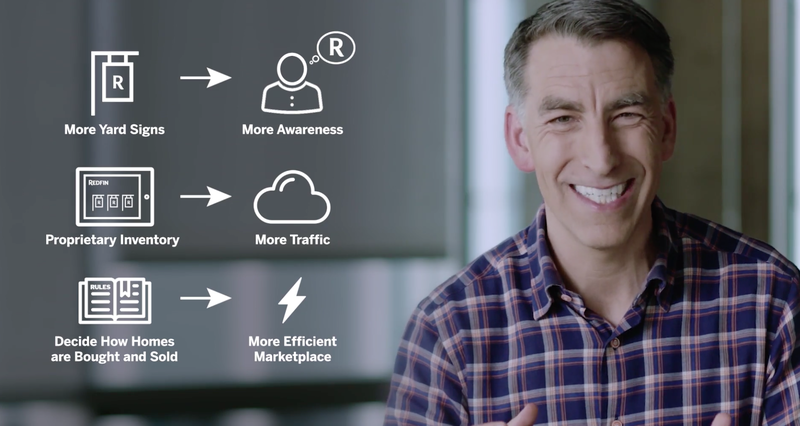 A slide from Redfin’s video presentation to investors shows CEO Glenn Kelman next to a graphic explaining the brokerage’s listing growth strategy. Redfin has built a popular property search website and digital tools for agents to serve up a low-fee, technology-powered experience for homebuyers and sellers. But even while deploying innovative technologies such as showings on demand, and 3-D home tours, Redfin has also migrated toward a more traditional brokerage model, adding more on-the-ground service, scaling back buyer rebates and increasingly tying agent compensation to sales volume. Progress has been gradual, but now the journey will pay off. Redfin anticipates issuing up to 10,615,650 shares priced between $12 and $14 per share, bagging as much as $148 million in a sale that values the company north of $1 billion.